Invacare® I-Fit™ and Invacare® CareGuard™Chairs offer stability, comfort and tool-less assembly in seconds. Invacare shower chairs are designed for individuals who require seating support when bathing or showering and provide comfort and safety in the bathtub. Available with a composite or vinyl padded seat, shower chairs fit in most standard tubs and showers. 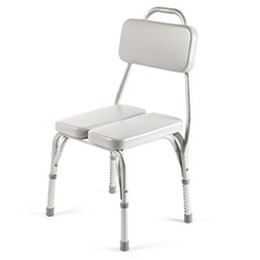 Seat Height: 17 1/2" - 22"
Height: 17 1/2" - 22"
Base Depth: 16 1/4" - 17"
Base Width: 19 1/4" - 19 3/4"